France and Germany are condemning the killing of Saudi journalist Jamal Khashoggi inside his country's consulate in Istanbul. French Foreign Minister Jean-Yves Le Drian called Saturday for an "exhaustive and diligent investigation to establish exactly who was responsible" for Khashoggi's death. Le Drian also said "those guilty of the murder" must be held accountable for their actions. German Chancellor Angela Merkel and her foreign minister, Heiko Maas, said in a joint statement Saturday that they condemned the death "in the strongest possible terms." They went on to say "we expect transparency from Saudi Arabia" regarding the details of Khashoggi's death and called the available information on the incident "insufficient." "Nothing has been explained so far," Merkel said, "and we need to explain it." European Union foreign policy chief Federica Mogherini said Saturday that the circumstances around Khashoggi's death were deeply troubling, and she called for a thorough, credible and transparent investigation. 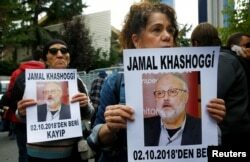 The statements came in response to Saudi Arabia's announcement that Khashoggi, who has been missing since entering the Saudi Consulate in Istanbul on Oct. 2, died inside the compound after "discussions" between him and people he had met inside the consulate turned into a fistfight. Saturday's comments were the first admission by the Saudi government that Khashoggi had died. President Donald Trump, who was at a campaign-style rally in Nevada on Saturday, told reporters he was not satisfied with the Saudis' explanation of what happened to Khashoggi. He added that it was possible Saudi Crown Prince Mohammed bin Salman had been unaware of the death. Rights group Amnesty International called on Saudi Arabia to "immediately produce" Khashoggi's body so an autopsy could be performed. Amnesty's director of campaigns for the Middle East, Samah Hadid, said the Saudi version of events could not be trusted. She said a U.N. investigation would be necessary to avoid a "Saudi whitewash" of the circumstances surrounding Khashoggi's death. Hadid said such a cover-up might have been done to preserve Saudi Arabia's international business ties. Earlier Saturday, a statement from the Saudi public prosecutor carried by Saudi state TV said 18 Saudi nationals had been arrested so far in connection with Khashoggi's death. The statement also said royal court adviser Saud al-Qahtani and deputy intelligence chief Ahmed Assiri had been fired from their positions. A senior official in Turkey's ruling party said Saturday that Ankara would never allow a cover-up of the death. Numan Kurtulmus, deputy head of the Justice and Development Party, said Turkey would share "conclusive evidence and findings" after an investigation was complete. "It's not possible for the Saudi administration to wiggle itself out of this crime, if it's confirmed," Kurtulmus said. Turkish officials had said they believed Khashoggi, a columnist for The Washington Post, was killed in the Saudi Consulate after he entered the building to collect paperwork for his scheduled wedding. 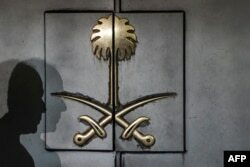 Saudi Arabia had previously denied the allegations and said Khashoggi left the building shortly afterward. The shadow of a security guard is seen on the entrance door of the Saudi Arabia's consulate in Istanbul, on Oct. 12, 2018. Late Friday, the White House released a statement acknowledging "the announcement from the Kingdom of Saudi Arabia that its investigation into the fate of Jamal Khashoggi is progressing and that it has taken action against the suspects it has identified thus far." When asked about the Saudi announcement, Trump, who was holding a campaign-style rally in Arizona, told reporters, "It's a big first step." However, he said, "We do have some questions" for the Saudis, and added, "We'll be working with Congress." He said he wanted to talk to the Saudi crown prince before the next steps were taken. When asked whether the Saudis could produce a credible report about the killing of Khashoggi, Trump said, "We're involved. Turkey is involved. … This has been a horrible event. It has not gone unnoticed." Before the Saudi announcement, Trump told reporters Friday that he might consider sanctions against Saudi Arabia over the disappearance of Khashoggi. U.S. Secretary of State Mike Pompeo discussed Khashoggi's disappearance during an interview Friday with VOA contributor Greta Van Susteren. Trump had warned there would be "very severe" consequences if it was learned that Saudi Arabia was behind the disappearance of the journalist, but Pompeo said, "I'm not going to get into what those responses might be. We'll certainly consider a wide range of potential responses, but I think the important thing to do is that the facts come out." Pompeo, who traveled to Riyadh earlier this week to speak to King Salman and the crown prince, told VOA, "I made very clear to them that the United States takes this matter very seriously. That we don't approve of extrajudicial killings. That we don't approve of that kind of activity. That it's not something consistent with American values, and that it is their responsibility as this incident happened in the consulate. "It's their responsibility to get to the bottom of this, to put the facts out clearly, accurately, completely, transparently, in a way that the whole world can see," Pompeo said. "And once we've identified the fact set, then they have the responsibility and the first instance to hold accountable those inside the country that may have been involved in any wrongdoing."